FIFA President Joseph S. Blatter kicked off a three-day trip to west Africa with a visit to Equatorial Guinea (Republica de Guinea Ecuatorial), according to reports by FIFA. 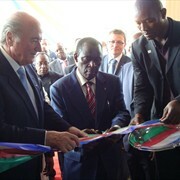 Blatter praised Equatorial Guinea for its development projects in front of a large crowd gathered for his arrival and the opening of the national FA's new headquarters and technical center. "This is the first time I have been to your country but it will definitely not be the last. You have so many development projects going on that I will almost certainly have to come back," Blatter said. Joining Blatter at the opening was a number of national dignitaries, including the Minister for Education, Science and Sport Filiberto Ntutumu Nguema, the Secretary of State for Sport Ruslang Obiang Nsue, and FEGUIFUT President Bonifacio Manga Obiang. Mr. Manga Obiang said, "We have been able to open these headquarters thanks to FIFA, who, as a result of this project, have given us the opportunity to operate effectively. I must say that all the programes that FIFA has put in place, such as the Financial Assistance Programe, Goal and Win in Africa with Africa, are playing their part in the gradual development of the game of football." Equatorial Guinea is hosting the CAF African Cup of Nations in 2012.